"The Building of a Community of Faith"
What the Assumption Church can become. Not just maintaining current programs, but enhancing current ministries in Youth, Spiritual Enrichment, Hellenism, and Outreach all of which are made possible by your Stewardship support. In other words, stewardship is your participation in the "Building of a Community of Faith." Throughout the life of the Church, parishoners brought as much as they could spare for the needs of the community. Providing for the sustenance of the clergy, widows and orphans, for helping the poor, and for all the good works of the church. 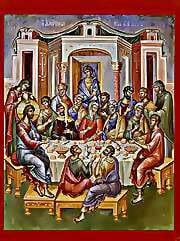 This is the Church that we as Orthodox Christians claim to be and we should strive to be through our stewardship. God's work through you. God will place you in situations to share your faith. As He called upon His disciples on the day of His Ascension, He has also called upon you to be His witness "...in Jerusalem, and in Judea and Samaria, and to the end of the earth." We also begin by bringing ourselves to Christ and His Church. But it doesn't stop there. After we have brought ourselves, we bring others. The greatest gift we can give to another person is Christ and the ministries of the Church provide the opportunity to do so. Your stewardship is the wind to those ministries. Giving Thanks for the Gift, that is our beloved Assumption. The key question here is to ask "what is your response in celebration to God's gift of your Church." In thanksgiving for the gift of our church from Christ himself, we ask that you offer your time, talents and treasure in proportion to giving thanks for our wonderful Church that Christ has given us now for 70 years. Gregory the Theologian writes, "You will never overcome God's generosity, even if you give away all that you have...And however much you bring to him, always more remains. Nor will you give anything that is your own; for all things flow from God (Orations 14:22)"
If you are interested in filling out a Stewardship form, please contact the church office.